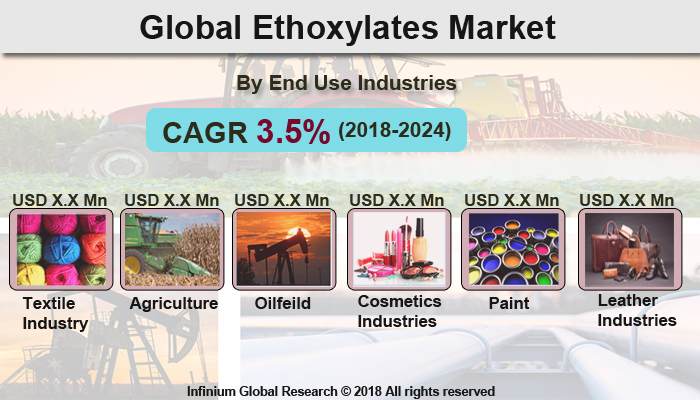 A recent report published by Infinium Global Research on ethoxylates market provides in-depth analysis of segments and sub-segments in global as well as regional ethoxylates market the study also highlights the impact of drivers, restraints and macro indicators on the global and regional ethoxylates market over the short term as well as long term. The report is a comprehensive presentation of trends, forecast and dollar values of global ethoxylates market. According to the report the global ethoxylates market is projected to grow at a CAGR of 3.5% over the forecast period of 2018-2024. Ethoxylates are organic compounds produced by the chemical reaction called ethoxylation in which ethylene oxide is treated with alcohols and phenols in the presence of potassium hydroxide as a catalyst. The Ethoxylates are majorly used in the manufacturing process of detergents, surface cleaners, paints, and cosmetics as an intermediate. The ethoxylates are used as the surfactant in textile, agriculture, paints and leather industries and are also used as stabilizing agents in rubber and cosmetics industries. The Ethaxolates are vastly used in the various end-use industries such as personal care, textile processing, and paints & coatings industries and others are driving the growth of the Ethaxolates market. In addition, various detergents are non-biodegradable as they cause soil pollution and water pollution that in turns increases the demand for low- Rinse Detergents. Rising demand for low-rise detergents is likely to boost the growth of Ethoxylates market. However, Ethaxolates have some toxicity issues, so the environment concern associated with the Ethaxolates is hampering market growth. Moreover, the ongoing research and development to introduced eco-friendly products are projected to create several opportunities for the Ethoxylates market in upcoming years. Among the geographies, North America holds the largest market share in the ethoxylates market owing to the steady growth of cosmetic and the personal care industries in this region. The Asia-Pacific is the second largest and fastest growing region in the ethoxylates market. In the Asia Pacific region, China holds the maximum market share owing to the large consumption of ethoxylates across various end-use industries including agrochemicals, construction, oil & gas, and several others. The report on global ethoxylates the market covers segments such as types and end use industries. On the basis of types, the global ethoxylates market is categorized into a fatty amine, fatty acid, glyceride, and methyl ester. On the basis of end use industries, the global ethoxylates market is categorized into the textile industry, agriculture, oilfield, cosmetics industries, paint, leather industries, and others. The countries covered in the North America region includes the U.S., Canada, and Mexico; while Asia-Pacific includes China, Japan, India, South Korea, Malaysia, and among others. Moreover, Germany, U.K., France, Spain, and Rest of Europe are included in the European region. The U.S. drives the growth in the North America region as it is the largest market in the region. The Asia-pacific region offers substantial potential for the market growth owing to rapid growth in markets such as India and China. The APAC region is projected to experience growth at a CAGR of x.x% over the period of 2018 - 2024. The report provides profiles of the companies in the global ethoxylates market such as BASF SE, The Dow Chemical Company, Sasol Olefins & Surfactants GmbH, AkzoNobel N.V., Clariant AG, E.I. du Pont de Nemours, and Company, Evonik Industries AG, India Glycols Limited, SABIC, Solvay S.A., Arkema SA (CECA) and Others. The report provides deep insights into demand forecasts, market trends, and micro and macro indicators. In addition, this report provides insights into the factors that are driving and restraining the global ethoxylates market. Moreover, IGR-Growth Matrix analysis given in the report brings an insight into the investment areas that existing or new market players can consider. The report provides insights into the market using analytical tools such as Porter's five forces analysis and DRO analysis of ethoxylates market. Moreover, the study highlights current market trends and provides forecast from 2018-2024. We also have highlighted future trends in the ethoxylates market that will impact the demand during the forecast period. Moreover, the competitive analysis given in each regional market brings an insight into the market share of the leading players. This report will help manufacturers, suppliers, and distributors of the ethoxylates market to understand the present and future trends in this market and formulate their strategies accordingly.